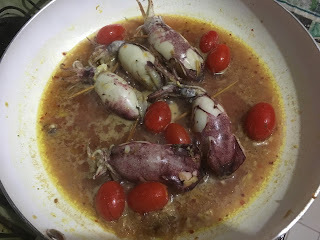 Never thought stuffed squid (sotong sumbat) is sooo easy to make. Recently, Fauzan & I have decided on a cooking schedule for dinner where each of us will take turn but usually Monday we'll do it together (actually, any other day it's just that the schedule is actually for us to decide what to cook because yes, deciding what to cook/eat is harder than preparing the meal itself). And then as usual i'll get creative on the menu because i think i really like cooking (but not baking) well, whenever i'm not lazy, that is. Can you see how i sliced the tomatoes? Grind the shallots & garlic, use half of the mix with egg & crushed cream crackers. Add a pinch of salt & pepper. 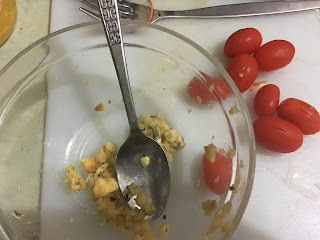 Make scrambled egg. Stuff the raw squid with the scrambled egg, use toothpick to stick the head together. Add the anchovies to what's left of the grind shallots & garlics, grind again (or not) & sauté 'em (hahaha is that the correct way of saying it?). 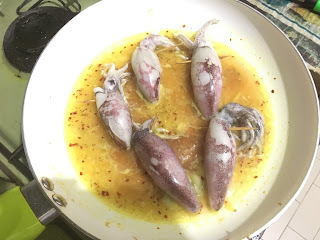 Once you smell the nice aroma, add about 1/3 cup of water, a pinch of salt, turmeric powder, teaspoon of chilli flakes, thin slices of ginger, a whoops-a-daisy of honey & once the sauce is boiling, put the squids in. Don't cook too long because the squids will get chewy. Add in sliced tomato or in my case, i used cherry tomatoes, sliced through. Flavour the sauce according to how you want it to taste. 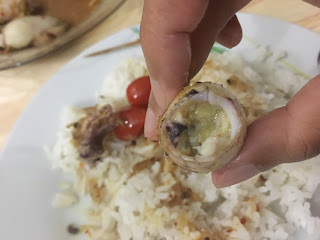 DON'T FORGET TO COOK RICE BECAUSE IT'S GOOD WITH RICE YUM!